Tonight was the opening of Watch From Here, the 2015 OSU Department of Dance MFA Concert Season presented in two parts over two weeks. 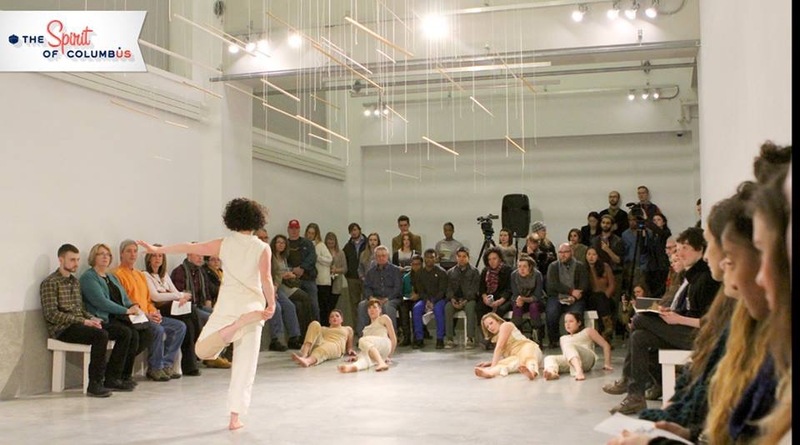 Part 1 features the work of choreographers Ani Javian and Megan Davis, along with their collaborators, at the Urban Arts Space in downtown Columbus. 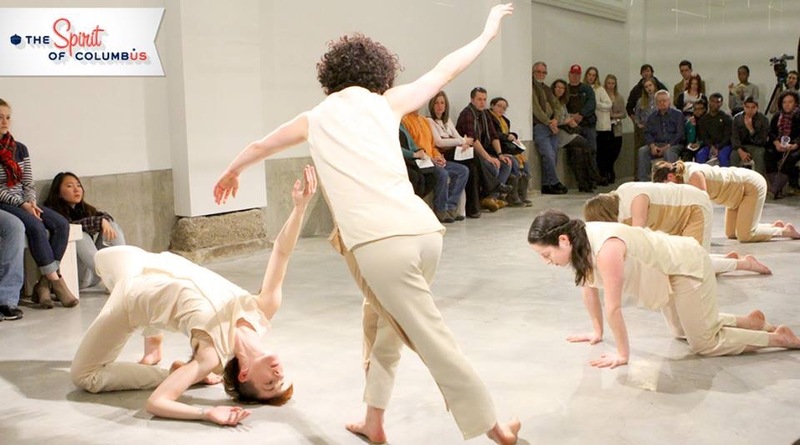 When the audience is allowed to enter the performance space—a long corridor with cement floor and high ceilings on the south side of the Urban Arts Space—four dancers are already present, their bodies crumpled softly on the ground, all at different angles, their limbs askew. 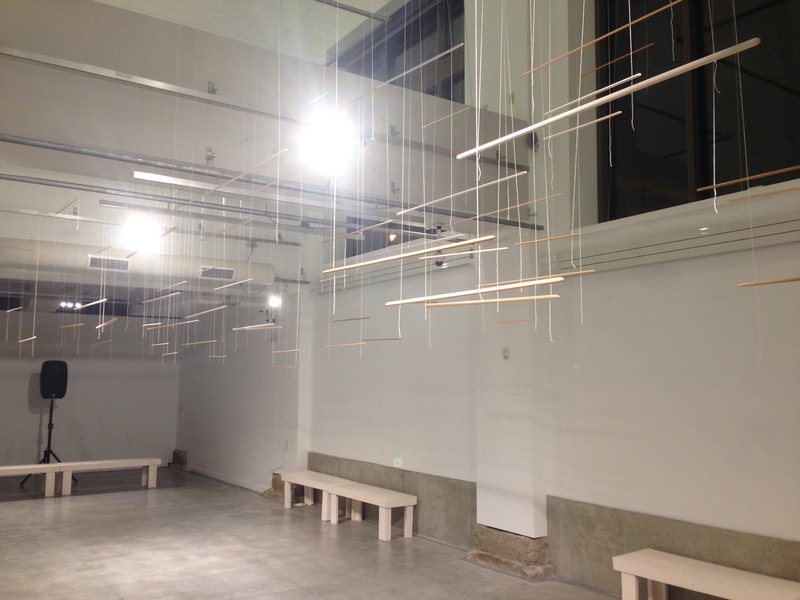 Above them, sculptural elements by Leah Frankel are suspended at many different elevations: the sculptures, what look like wooden dowels painted different tones of beige hanging from filament, all hang parallel to one another, running along the length of the gallery space from east to west. The audience sits or stands on all four sides of the space, and small, almost tentative rocking and swaying actions shift through the dancers’ bodies. 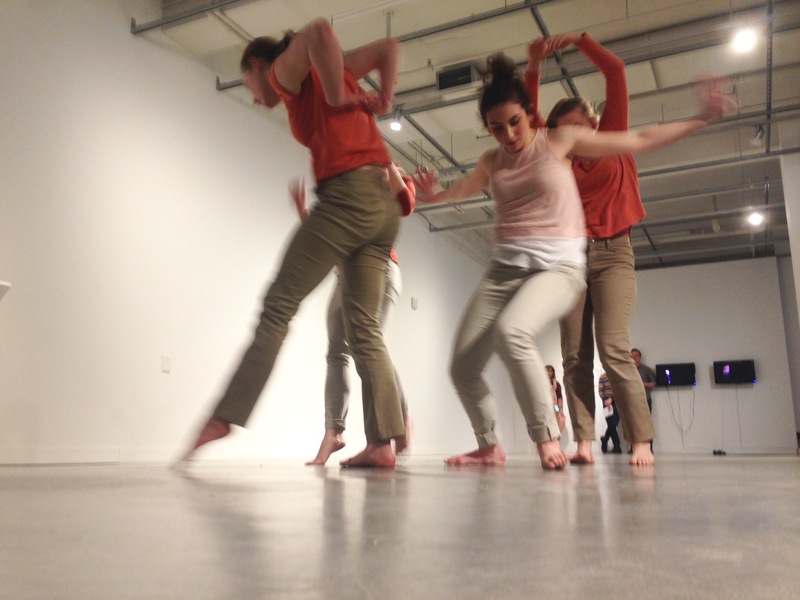 A fifth dancer, Shannon Drake, runs suddenly into the space, making her way through the bodies on the floor to the far end of the gallery. Whereas the four dancers on the floor move almost beneath the threshold of perceptibility, Drake’s movements are strong and full-bodied, their force pushing impatiently through the duration of each passing second. She runs back and forth along the longitudinal length of the space, across and around the bodies on the floor. As if stirred by Drake’s rapidity, the four on the floor—Abby Carlozzo, Kelly Hurlburt, Sarah Levitt, and s.lumbert—quickly move towards each other and line up, horizontal and side by side. Their tiny shifts and swaying now press into each other, and I am drawn into soft places when flesh presses into flesh. Their costumes—sleeveless tops and pants all pieced together from multiple shades of beige and tan—along with their skin—all of the dancers are white—give the group of bodies a kind of homogeneity. The skin, the costumes, and the multiple beiges of the sculptures hanging overhead comprise a narrow consistency across multiple elements of the dance; the dance develops as bodies push and roll and speed up and come together and apart all within this narrow space. Over the duration of the dance, the dancers roll over and alongside each other; they lift one dancer into the air and maneuver her around the space; they crawl and dance in pairs and other small groupings; they drift in and out of unison with each other; they inhabit any number of levels of space, moving high up into the air, down flat on the floor, and many elevations in between. Across the group, the choreography introduces a range of dynamics and speeds: legs and arms slicing and flinging through the air, rolling quickly across hands and knees and hips, and also standing still and slowing down, the dancers carefully circling limbs in their joints, as if never fully deciding where they could move next. My initial reaction to the dance is that it shows something about the multiple dimensions of variability within a presumably narrow range of possibilities, the speed and intensity and spatial configurations that are possible within the limits of various approximations of beige. But it is more specific than that. It is not only the colors of the costumes and dancers and sculptures that suggest narrow possibilities: the parallel alignment of the sculptures, their cumulative adherence to the longitude of the room, and how they mark out a collection of singular, rigid elevations in space, all introduce systems of measurement, lines and levels that organize how I perceive the dimensions of the space and the bodies moving within it. The sculptures establish a three-dimensional grid, striations across the space that refer to global(izing) perspectives for the linear demarcation of position within a given frame—longitude, latitude, elevation away from the center of the planet. The architecture of the space, its four walls, its floor and ceiling, already iterate these dimensions; Frankel’s sculptures extrude these dimensions into the air and give a constant frame of reference for determining how these dancing bodies do and do not line up within that frame. Sometimes the dancers literally line up, flat to the walls or ceiling, all in a straight queue. But more often, they move across and between these straight lines and planes; they accelerate and decelerate over and through curving pathways and diagonals that cut the space in temporary, renegade formations. And most importantly, they do so together. Not only does the choreography the dancers perform never fully or permanently conform to the geometry of the room or sculptures—or the rigid linearity that those structures impose—neither do their connections. This dance is full of bodies coming to one another, pressing against each other, sometimes moving apart, but then keeping up with each other as they move. The soft places where bodies come into contact, the shifting dynamic relationship between two bodies that may not be in contact but nonetheless attempt to move with each other in some direction, map out a different geometry, a fleshy, sweaty, pulsing spatiality that knows nothing of rigid structures or hard lines. Where and how bodies meet and stay with each other exceeds the terms of the grid above them. Even in the final moments of the dance, all five bodies have once again crumpled to the floor at various elevations, more or less in line with each other along the length of the room. But their lines are multiple, soft, and loose, curving smoothly around their shoulders and hips and spines, facing in directions that are not fully one way or another. The right here-and-now of bodies with each other refuses to be constrained within totalizing frameworks of rigid spatialities; bodies, it seems, are already elsewhere, even when they are right here. 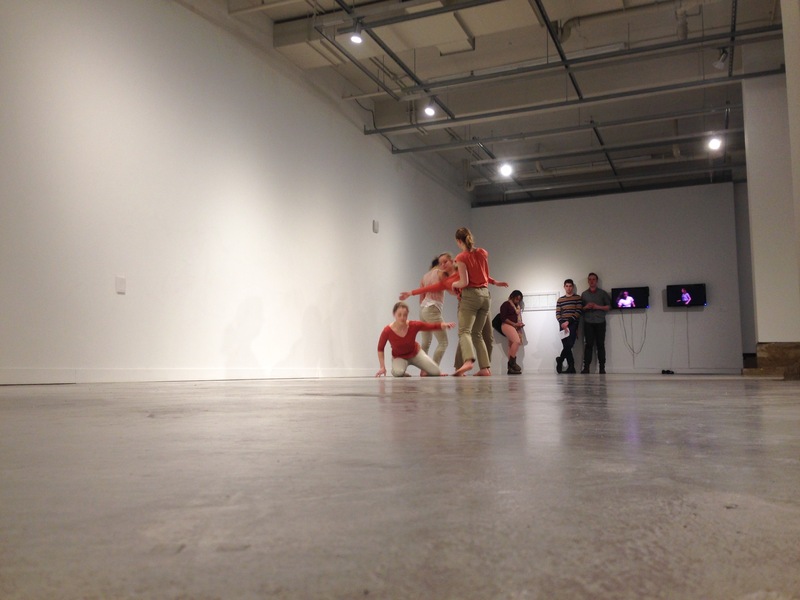 Megan Davis’ Trace Forms, developed in collaboration with the performers—Lilianna Kane, Maddie Leonard-Rose, Claire Moore, and Stacy Shelts—involves both a dance and an exhibition of various forms of documentation of dancing. The walls are lined with sketches, drawings, video documentation, and writing about dancing that came out of the choreographic process through which the dance was developed; the dance takes place surrounded by these various traces of dancing in several media. The dance begins, and from where I am sitting on the floor, I can see two dancers leaning against a wall, rolling against it, and sweeping their hands over its surface. A foot emerges from behind one of the large columns in the middle of the gallery, and gradually two more dancers come into view. These first few moments are very tactile: the contact between the dancers and the wall seems more important than the specific gestures or movements that they are doing. The movement seems to come from the contact, to support to tactile encounter, to experiment with it. 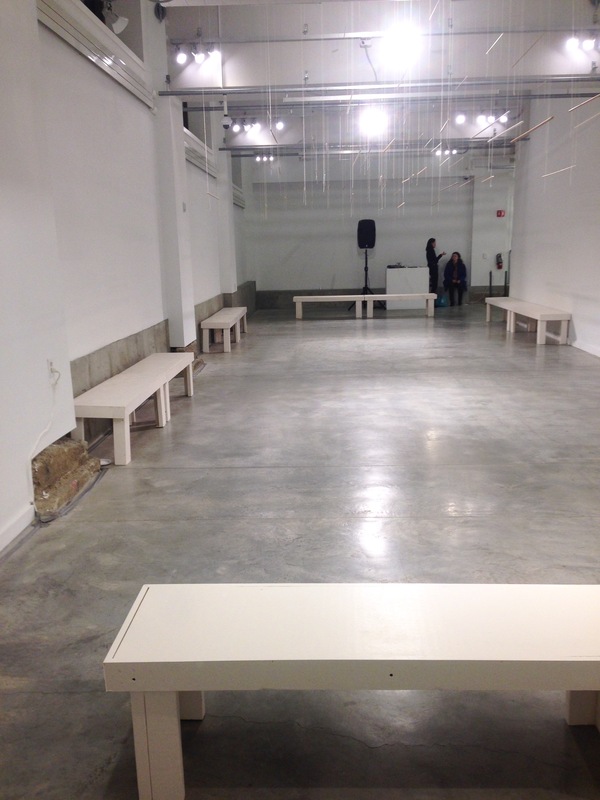 Eventually the dancers move out into the space, and form a line at the east end of the gallery. In front of them, two monitors display video of these dancers in rehearsal. I don’t know if they are watching themselves in the videos, but I am watching them, their actual bodies in space, the images of their bodies on the screens beyond them. Their line turns, and they begin to move as a pack, maintaining degrees of proximity to each other. The movement is simple: walking, assuming a position, gesturing from that position, the arms or legs extending in lines or arcs around where they began. Two dancers move out into the space with a long roll of paper, and as they unroll it, I can see colored lines looping and curling and streaking down its length. Given the context of the exhibition materials, I understand these lines to mark out some piece of the choreographic process, some trace of movement—drawing, if nothing else—that has been recorded along this scroll. The dancers circle around the space, carrying the paper into different spatial orientations, twisting it, folding it, manipulating it. In a way that is quite literal, they repurpose this history, rearticulating this record of something that occurred before in a new way for new purposes in the present. As I watch, I am thinking about the records that we keep, these lines on paper, the gestures of dancing images on video monitors, the lines and shapes the dancing bodies make in space that disappear as quickly as they appear. Within moments, the paper is rolled back up, and I realize that whatever may be retained from the past may not remain accessible. Davis and the performers are dancing at the edges of archives—how we retain what has happened, how we use or access what we have retained—moving with and between these records, these lines and paper and digital images and words. Later in the piece, the four dancers create a loose circle, and one by one they each dance as the others watch. As a viewer, I am not only watching a dancing body; I am also watching three others watching her dancing. I cannot avoid the fact the this body is viewed/viewable from multiple perspectives, and no one perspective can provide a full view. This multiplicity of perspectives—or my attention to it—is compounded as the dancers move forward, and the rest of the audience comes into my sightlines. As we are watching them watching each other, we are also watching each of them and each other watching them: more perspectives of more perspectives. The dancers break into pairs and move in contact with each other, reminiscent of the opening dancing in contact with the wall. Here they dance with their eyes closed, their bodies feeling and following each other. Moments before, we witnessed them witnessing each other; now their witnessing has become entirely haptic, tactile, touching and feeling touching, body to body in a much more personal, intimate way. Gradually, they drift apart from each other, each dancing on their own, and I feel a wave of sadness: I continue to watch them, we continue to witness them in their eyes-closed dances, but they no longer see or feel each other. We witness them and we witness them no longer witnessing each other. Like the scroll that was rolled up and taken away, like the limited access to records, witnessing, it seems, has its limits and will not go on indefinitely. There comes a time when each body is left to itself, its experience of itself and no other. One by one, the dancers open their eyes, make their way out into the audience, turn, and join us watching the others who continue to dance. At last, the space is empty, and we are all looking around at each other looking around until the music ends and the clapping begins. These final moments are crucial as the dance directs us from seeing the dancers perform back towards seeing each other. From the dance to the exhibited materials and back again, Davis examines traces, records, the accounts that remain from the multi-faceted experiences that each of us undergo, on our own and with others. Whatever is happening right now is only part of any story; it is a point along a process—or any number of processes—that extend in any number of directions into the past and towards a future. In Trace Forms, Davis shows that no action or event fully discloses its own history of formation. No moment of any person can reveal that person in any entirety. Across multiple media, marking out pieces and outlines of what has come before, pushing into what is unfolding right now, and holding up some possibilities of what might remain, the dance and the exhibit together offer not a singular, authoritative record of happenings, but an account—or several—of experiences from a collective of perspectives. There is no total account of what has happened, what is happening, where it came from, or where it might lead. Rather, accounts are multiple and partial, incomplete, and rely on countless points of view; they never add up to a complete record, but accumulate traces that we share, tracing what and how we share what can be shared, and opening up any number of possibilities for where we might go from here. 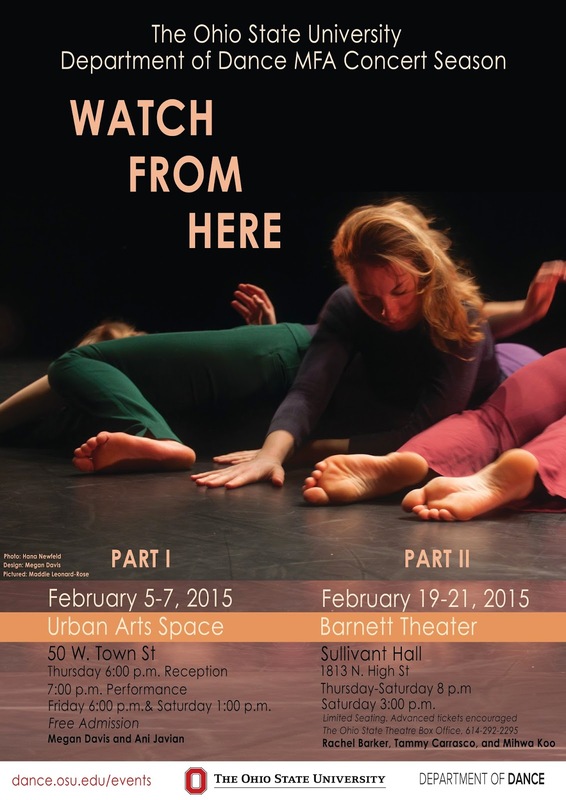 Watch From Here: Part 1 continues at the Urban Arts Space on Friday, February 6 at 6pm, and Saturday, February 7, at 1pm.